Join the battle to maintain the universal balance between darkness and light with all the popular characters from the animated TV series: Ang Lueng never dreamed that he would be the next Golden Dragon. He always assumed his twin sister, Ling, the best fighter of the Dragon Dojo run by their mentor Master Chin, was next in line. Ling is deeply humiliated. She swears to take vengeance upon those who betrayed her, starting with her brother and Master Chin. The lure of power from the Zodiac Master proves too much for Ling. Her hatred leads her into darkness and she becomes the Shadow Dragon. 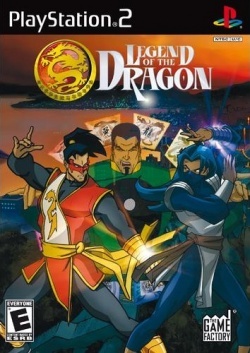 Enjoy the magic tale of the Legend of the Dragon in this combat action/adventure game that combines the fighting sequences and compelling story line of the TV series - all wrapped up in game play and animation. All the important places from the cartoon series are present in the game as combat arenas: The 12 sacred temples, The Dragon Dojo, The Zodiac Master's hideout, The Temple of Shadow Dragon, The Great Wall of China, Hong Kong Bay. 8 different game modes ensure hours of challenging game-play: Play Quest mode, Arcade mode, Training mode, Survival mode, Time Attack mode, versus mode, Team Battle mode, Tag mode. This page was last edited on 18 November 2016, at 17:18.